But there is something special about it in the sacrament. You see, in this ordinance the Priests don’t only bless the emblems of Christ’s atonement: they are also the ones who break the bread. Think about that. The love He had and continues to have for His Father – our Father – and for us is mind-blowing that He would make this sacrifice by choice. But He did, and there is no better example of this than the breaking of the bread in the sacrament. There is a second reminder here, though. You see, it is imperfect people who are representing Him. While that is true in all ordinances, of course, in the Sacrament it is the imperfect Priest who symbolically breaks Christ’s body in an ordinance that represents Christ’s complete victory over death and hell. 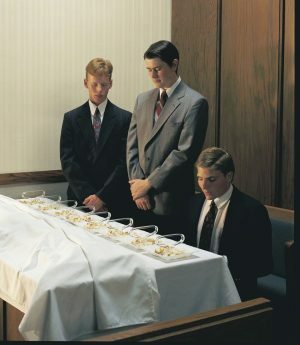 In other ordinances, an arm may be raised or hands placed on heads, but it is only in the sacrament where the violent act of His death is re-enacted in this way. Thus, the Priests also represent all of us, for we are the ones who caused the blood to fall from the pores in His body. It was for us that He hung upon the cross and surrendered His mortal life. We are the ones who broke His body. When I have the wonderful opportunity to act in the role of the Priest and bless the sacrament, I am thus reminded of this even as I stand and, representing Him, break the bread. It is because of my sins, my foolishness, my pains that His body was broken. I am breaking his body. Thus, the beautiful irony. And then I, the one who just battered His body, have the audacity to kneel and bless those very emblems of His sacrifice! What a wonderful example of the principle of Justification in action. Yes, the Priests who break and bless the bread are woefully imperfect, as are we all. And yet, because we try to keep His commandments and honour our covenants, by His blood He smiles upon those same Priests as they stand and then kneel in His place. This principle is reinforced further as the Priests kneel to offer the prayer, one of the very few times in the LDS Church where it must be word perfect. Just as the Perfect One introduced this beautiful ordinance, it must be performed perfectly. Any errors in wording must be corrected. Perfection every time – even when reading the words from a card in front of you – isn’t always possible. Mistakes happen. But no matter, the words of the prayer can be spoken afresh. The Priest can make a mistake once, twice, five times, ten times or more. But he’ll always get another chance to get it right. That, too, is a wonderful lesson for us all, and the reason why I am actually pleased when there is the occasional mistake in a sacrament prayer and the Priest has to repeat it. It reminds me that no matter how many times I fail, because of Christ’s atoning sacrifice, I can always try again. No matter how often I fall, there will always be a hand there to help me up again – His hand. I have felt His grace so often in my life. Times when I had no power to stand on my own. My health means that I can no longer stand for very long (i.e. more than about 30 seconds) before I have to sit again. But spiritually, I can always get up again. Because of Him.